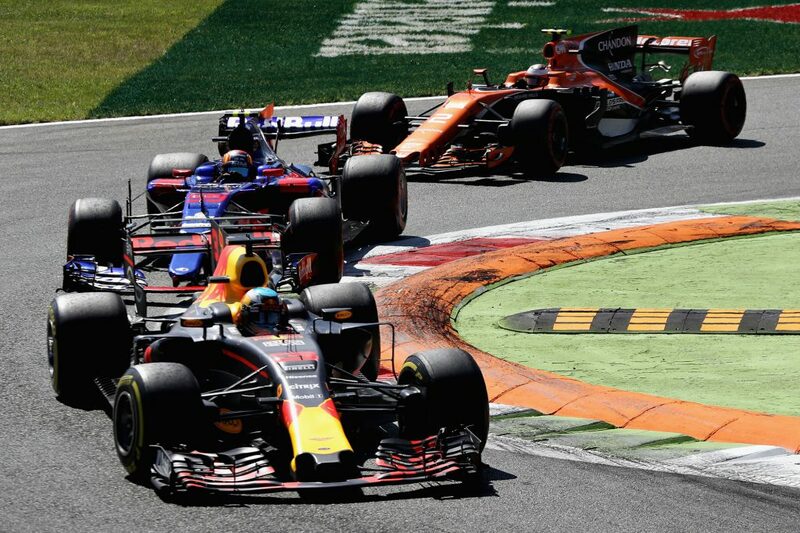 Italian GP F1 Strategy Report Podcast – our host Michael Lamonato is joined by Luca Manacorda from FormulaPassion.it. 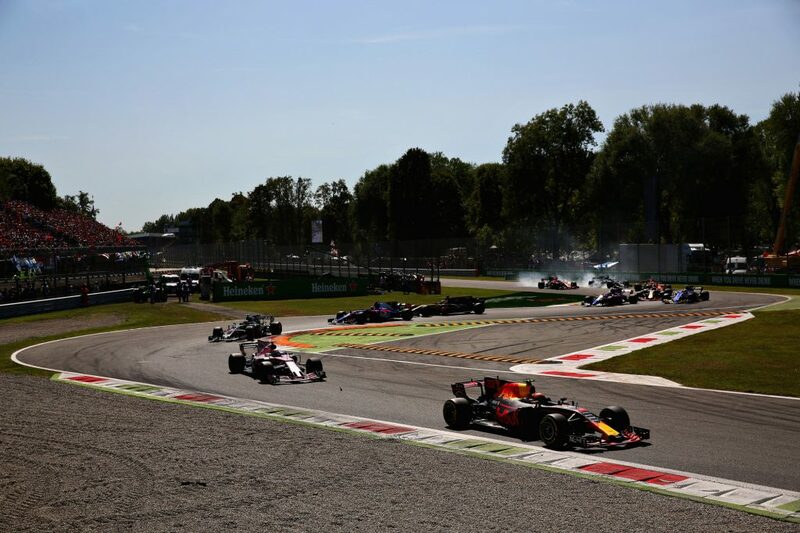 A record number of spectators flocked to Monza for last weekend’s Italian Grand Prix, most of them eagerly hoping for Ferrari success at the team’s home race. 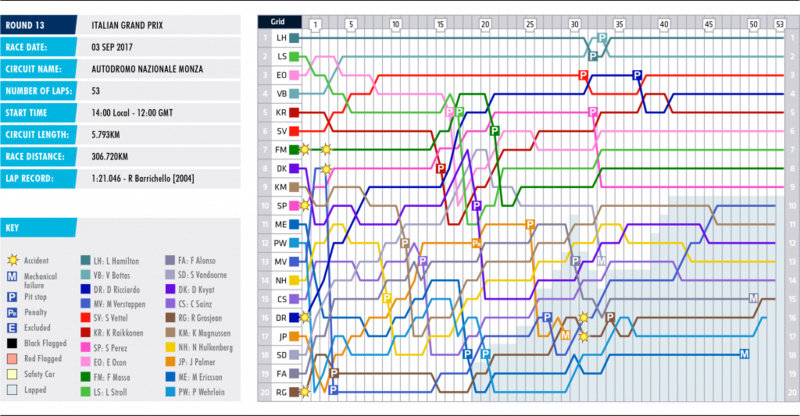 That wasn’t the case though, with Mercedes dominating proceedings. But despite Lewis Hamilton and Valtteri Bottas running away with a one-two finish and Sebastian Vettel coming home a distant third, there was still plenty of action and drama further back to keep fans and viewers entertained. Monza’s one of the most unique and exciting races on the calendar and the circuit lived up to its ‘Temple of Speed’ nickname, with some fast-paced action and ridiculous speeds. In fact, Hamilton’s 151.382mph average winning speed is the fifth quickest of all time. Wet weather threatened on Friday but failed to really appear, but it eventually arrived on Saturday, postponing and delaying qualifying. When the sessions eventually got going properly, the rainy conditions spiced the grid up nicely, with several drivers qualifying out of position. The wet weather opened up strategy options for the dry race, because all 20 drivers got the choice of tyre compounds for the start. But, while the wet weather mixed up the order for the start, it was the whole host of grid penalties that properly mixed things up. Nine drivers in total had penalties for gearbox and engine component changes, which is a ridiculous number, really. Hamilton was the only driver to retain his qualifying position, breaking the all-time pole position record, and he was joined by Lance Stroll on the front row, ahead of Esteban Ocon, Valtteri Bottas, Kimi Raikkonen and Sebastian Vettel. 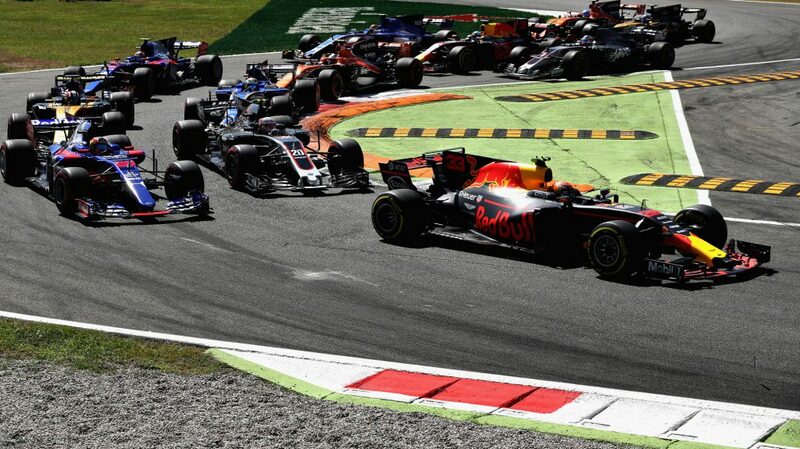 Max Verstappen was down in P13 and Daniel Ricciardo P16, setting up a tasty fightback for Sunday. 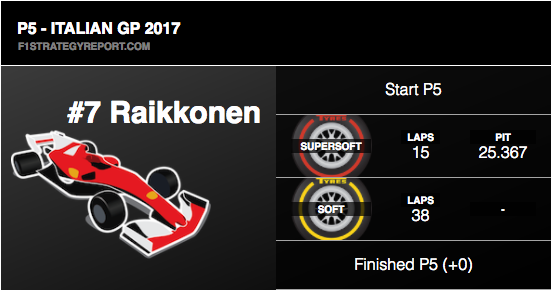 The vast majority of the field went for the softest compound of the options available, the super-soft, for the race start. 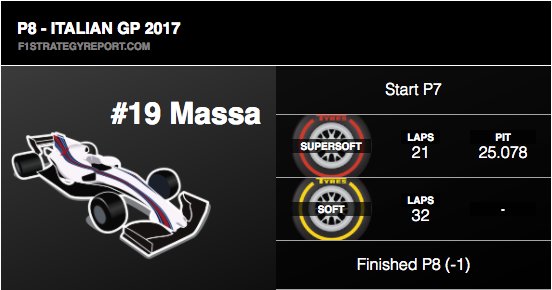 Despite lacking some data due to Saturday’s rain, degradation and durability was strong at Monza and the super-soft worked well, lasting quite a long time. Four drivers – Ricciardo, Verstappen, Fernando Alonso and Jolyon Palmer – decided to do something different on soft tyres. A well-timed power unit upgrade for Belgium, which customer teams have yet to receive, put Mercedes one step ahead of the pack at Monza and this gave the team an even greater advantage, on a circuit that was always going to suit the Silver Arrows. Bottas was quick all weekend but still struggled to match Hamilton, struggling a little in the rain on Saturday. 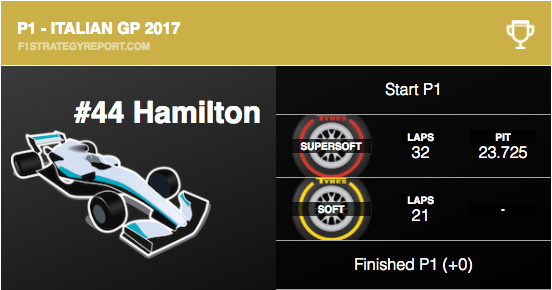 Hamilton stormed to pole position and was in complete control in the race. He was able to run his own race, with a long 32-lap stint on super-softs before switching to softs. 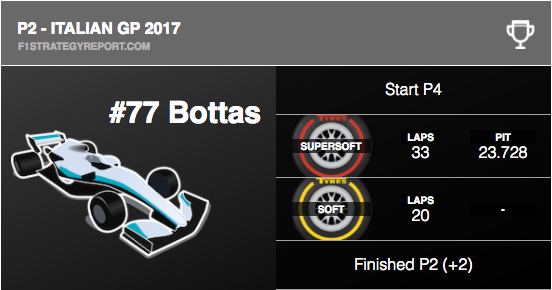 Bottas made progress in the early laps to move into second place and followed Hamilton into the pits one lap later. 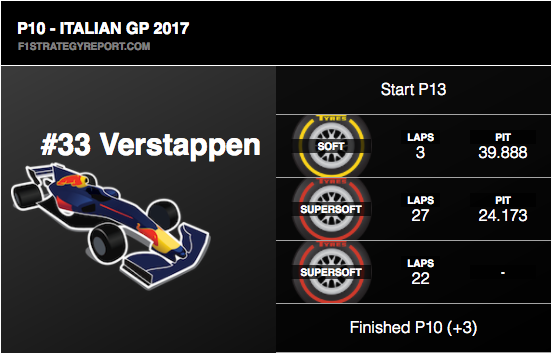 Both Red Bull cars looked set to go long in the first stint, on soft tyres, but Verstappen’s early puncture ruined that. Ricciardo pressed on with that strategy, using the RB13’s superior pace to displace many midfield runners through strategy alone, although he also had to do some on-track overtaking too. 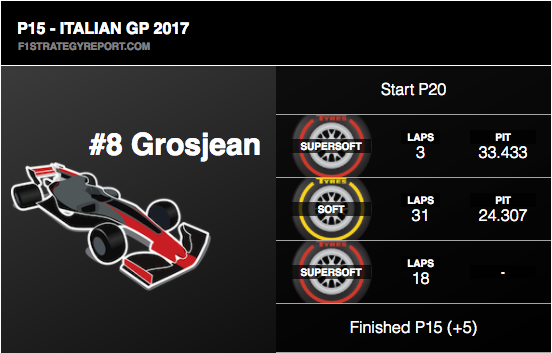 He emerged from his stop in P5, making up several spots compared to where he was before the pitstop cycle began, and quickly made good use of his softer, fresher tyres to put an almighty overtake on Kimi Raikkonen into the chicane for fourth. 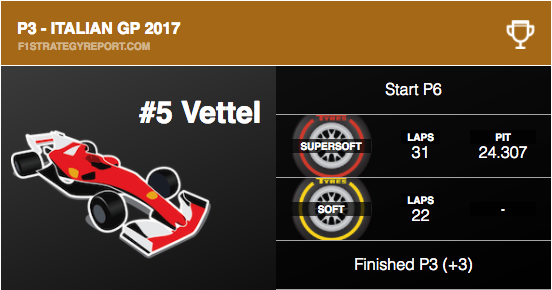 The Aussie started closing on Vettel but ran out of time and tyres in the final laps, having to settle for fourth. Interestingly, he completed a similar strategy back in 2014 and 2015 at Monza. Alonso and Palmer both tried to do the same but eventually retired with issues, having battled closely on track. Perez tried to do the same as Ricciardo, but on the super-soft tyre for the long first stint, before switching to fresh softs. 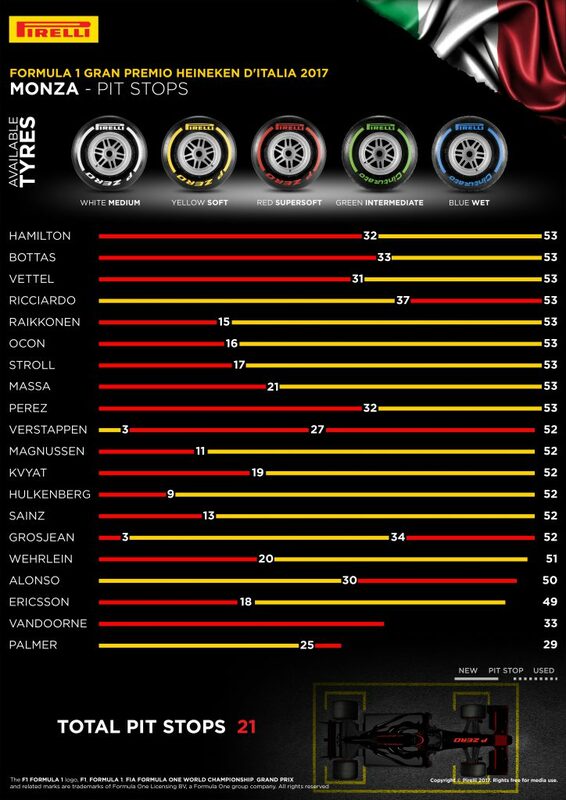 He had a lot of tyre life and performance towards the end but eventually ran out of time, not helped by those he was battling also having Mercedes power. It appears there was some scope for improvement, had he pitted a few laps earlier and put those soft tyres to work, he might’ve gained a spot from Massa. Both ended up closing on the duelling Ocon and Stroll, but couldn’t get through. 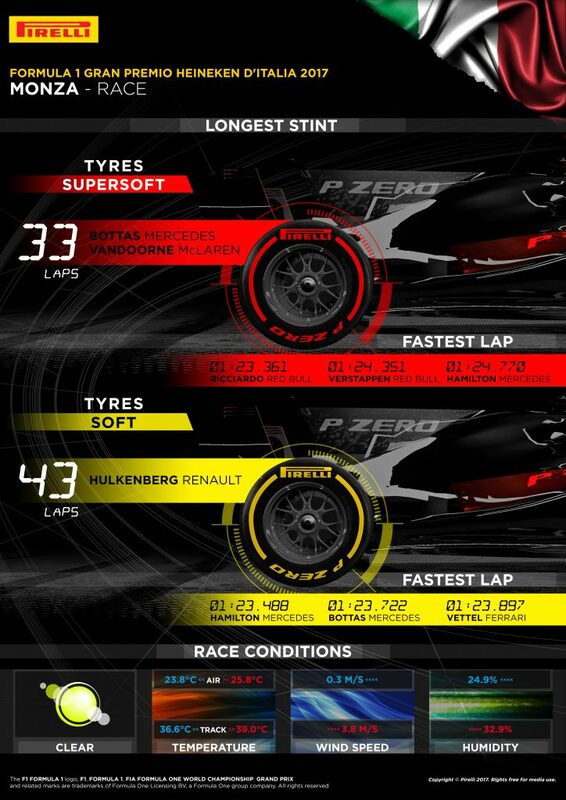 The main battle within the top 10 was decided by pitstops. Stroll was undercut by Raikkonen thanks to an uncharacteristically slow stop from the Williams crew, although Raikkonen’s wasn’t all that speedy either. Ocon, Stroll and Raikkonen were separated by 0.5 second intervals before the stops but Raikkonen pitted first, followed by Ocon one lap later and then Stroll on the following tour. Stroll was two seconds back from Raikkonen afterwards, and he finished a few seconds behind Ocon at the finish. Nico Hulkenberg did the opposite of Ricciardo, pitting early on lap nine to go from super-softs to softs, but while this gave him a speed advantage early in his second stint, it left him easy pickings for Daniil Kvyat and Verstappen to pass him in the closing laps after losing tyre life.